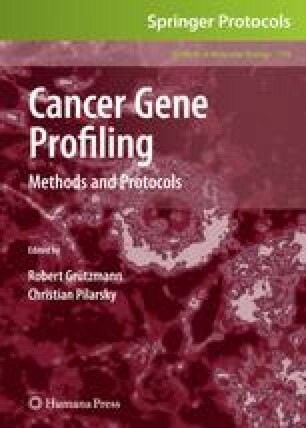 The introduction of new high-throughput methodologies such as DNA microarrays constitutes a major breakthrough in cancer research. The unprecedented amount of data produced by such technologies has opened new avenues for interrogating living systems although, at the same time, it has demanded of the development of new data analytical methods as well as new strategies for testing hypotheses. A history of early successful applications in cancer boosted the use of microarrays and fostered further applications in other fields. Keeping the pace with these technologies, bioinformatics offers new solutions for data analysis and, what is more important, permits the formulation of a new class of hypotheses inspired in systems biology, more oriented to pathways or, in general, to modules of functionally related genes. Although these analytical methodologies are new, some options are already available and are discussed in this chapter. This work is supported by grants from the Centro de Investigación Biomédica en Red de Enfermedades Raras (CIBERER), ISCIII, projects BIO 2008-04212 from the Spanish Ministry of Education and Science and National Institute of Bioinformatics (http://www.inab.org), a platform of Genoma España. EA is supported by a fellowship for the FIS of the Spanish Ministry of Health (FI06/00027).